I'm trying to find a certain style of font but I'm not sure what to search for. It's the same font as in the Vox News logo. 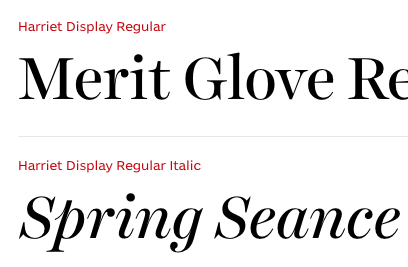 Also something like the Harriet Display family. This font belongs to a roman family called Transition Romans or Transitional Romans. The name comes from the transition in time and shape between the ancient and modern romans. All romans types has common points, the difference between them is how they are made. Not the answer you're looking for? Browse other questions tagged typography font-identification font-recommendation typefaces or ask your own question. What font is used in Kulu's logo? What is this old font like Pacman or Modern Plate from real estate agency? What font is used for this 85 years logo? What is the font in the Billund Airport Logo?